We made endless fun of him for his obsessive advanced planning — and yet, there I was, two years ago, with our holiday table all ready to go (sans the fresh flowers) a full week and a half before any guest would walk through my white-Christmas-light-framed doorway. The truth is, that dinner was the first Christmas dinner Andy and I had ever hosted (usually it was at my parents’ or Andy’s parents’ house), and I was overwhelmed by all that had to go into feeding ten adults and six children. I found that hosting the holiday dinner wasn’t like the rest of the season’s chaos — much of which could be done in advance and usually one-clicked while waiting for the chicken to finish roasting. When I sat down and looked at my dinner to-do list, it was a lot of last minute shopping and stressing and the only thing I could think of to do to feel more in control was…set the table. It felt so good to have that part of the event under control that now I do it before almost any occasion that merits the Dining Room Table treatment. Phoebe’s Secret Agent Party birthday table was set at least three days ahead of time and when Andy came home from work that night and saw it, he looked at me like I had nine heads. Just like we all used to look at Dad. But Dad gets it. I know he’s running around the county right now picking out gifts for his six grandchildren, and I’m sure he’s overwhelmed by the chaos, too, but I’m guessing that wherever he is, whatever he’s doing, his table is set. PS: Andy made an apricot-bourbon glazed ham for that holiday dinner and it rocked. Look for that post in the next week. A simply gorgeous table. I love it. This post is inspiring. Every year, I resolve to have the table set before my guests arrive on Christmas Eve. Yet every year, my aunt returns from church with us and starts asking, “what tablecloth do you want to use?” (Usually the one I want to use is crumpled in the ironing basket, where it has been since last Dec. 26th), and tromping around the yard cutting shrubs for a last minute centerpiece. It always looks wonderful, yet I feel like an incompetent child just pretending to be the hostess. Since I am home today with a slightly sick child, maybe I can clear the as-yet unsused holiday decorations and craft projects off the dining room table, put them away, and set the table! I love these little peaks into your organizational/personality quirks…we all have our little things that give us peace. I wish a set table was mine. My table is set for Christmas brunch. Our 2nd year hosting. I’m with your Dad… definitely something productive-feeling about having that done in advance. As if I am all ready, when in reality I haven’t even finalized the menu. Did your family sit down together for breakfast every morning when you were growing up?? Could Breakfast: A Love Story be your next book?! I always set the table the day before a holiday as well, but a week and a half?!?!? 2 questions–don’t you eat at the table other days? Weren’t you worried the plates would get a little dusty? I can’t imagine having a table that didn’t get used every day, so this seems completely crazy to me. The night before for breakfast the next day, I get. love how the color of the flowers reflects the oranges. but, yeah, having the table pre-set for a week would make me feel like i lived at macy’s. This must be a look into some fantastical realm where there is such a thing as a dining room. I hope to move there someday. 😉 Your decorations are very nice! Those last few sentences caused me to tear up. This is beautiful. 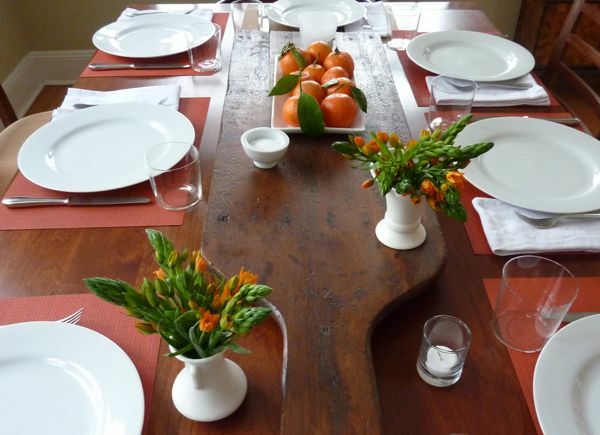 I love that a post about setting a table can turn into a tribute to tradition and to your Dad. Love this. What is that board in the center of your table and where can I get one like it? It’s amazing! Wait. YOUR dad is named Ivan?! MY dad is named Ivan. And my sister is Jenny. Weirrrrrrd. Oh Ivan! You and Alan (aka, my dad) must have been separated at birth. What a nice thing you did for your family (as my dad did for us). I must admit (and Jenny knows this), I am not the most friendly individual in the morning, so my dad probably did in in the name of self-preservation. Love those dads! Our dining room table is always cluttered-mail, bills, homework, papers to sign, toys……you get the idea. Somewhere I read that keeping your dining room table set for a dinner party helps the table from becoming a stopping ground for all of the above objects. This has proven true at our house. The table is set for 4. Real plates, cloth napkins, retro glasses, silverware and candles. No more junk on the table!! This has however led to an unexpected problem…..dusting the dishes before actually using them!